Periodontal disease, tooth decay, and traumatic accidents can often lead to the loss of a permanent tooth. When this happens, dental implants are an ideal replacement option for many adult patients. With good general oral health, proper placement, and routine maintenance, natural-looking dental implants can last for a lifetime. 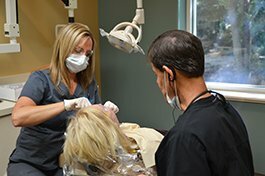 Mini Dental Implants are the newest advancement in implant dentistry, making it possible for St. Augustine dental implant dentists Dr. Domingoes and Dr. Valdes accomplish incredible restorative transformations. Mini Dental Implants can help to securely anchor loose dentures or replace one (or more) missing teeth. In fact, many patients have enjoyed the pleasure and convenience of having a full arch of teeth replaced—often in just one short visit. Dental implants are designed to permanently replace single teeth, several teeth or even all of the teeth in the jaw. The main portion of an implant looks like a small cylinder or screw that is made from biocompatible titanium. Through a minimally invasive surgical procedure, the implant is placed into the jaw where it is left to heal for period of 2-6 months. During this time of healing, the implant and the jawbone will become bonded together in a way that is similar to the relationship between a real tooth root and the jaw bone. This provides a permanent and secure anchor for a crown, bridge, or denture. No natural teeth will need to be altered or compromised to support an implant, as is the case with bridgework. This is a significant benefit since leaving more of your own teeth untouched is important to your overall health. The solid integration of the dental implant into the structure of your jaw bone will help to prevent gum recession and the possibility of future bone loss which is sometimes a consequence of bridgework and dentures. Dental implants will mimic the function of your natural teeth, adding more comfort and stability than traditional dentures. For a complimentary evaluation and to find out if you a candidate for dental implant technology, please contact our office today.